In a batter bowl with a spout, whisk together the condensed milk, half-and-half, lime juice, and lime zest until thoroughly combined. Divide the mixture among popsicle molds, leaving a little bit of room at the top for the mixture to expand. Freeze according to manufacturer instructions. If using a popsicle maker similar to ours, cover with the lid, insert the popsicle sticks, and transfer to the freezer. Freeze the popsicles until solid, about 5 hours. To unmold the popsicles, remove the lid from the mold. You can run the mold under lukewarm water for a few seconds, or until the popsicles are easily dislodged. Since our molds are transparent, we can see the popsicle dislodging and can pull it out once its color has faded away from the mold. Once dislodged, store the popsicles in heavy-duty plastic ziplock bags or prepare immediately. Just before serving, cover each popsicle in graham cracker crumbs. 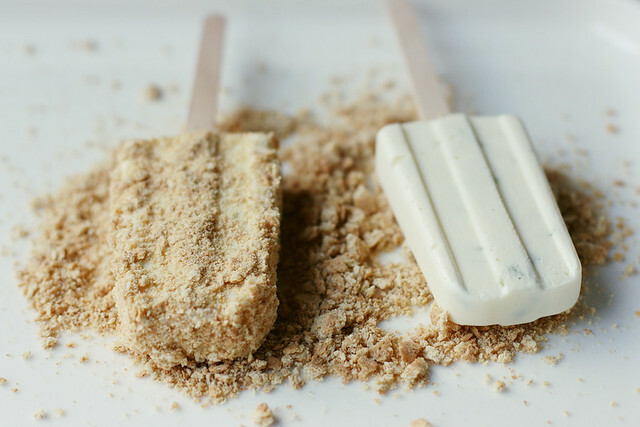 On a plate, spread out some graham cracker crumbs and press each side of the popsicle into the crumbs. Depending on how coarse the crumbs are, you may need to press smaller crumbs in with your fingers in order to completely cover the popsicles. We have this popsicle mold and it serves its purpose but it’s not perfect. The lid doesn’t snap on, which means that we have to be careful to not shift the sticks before the popsicles freeze otherwise it is hard to remove the lid once they’re frozen. Look for food-grade popsicle sticks. A batter bowl with a spout is nice here because you can pour the wet mixture straight into each popsicle mold. If you don’t have a bowl with a spout, you can transfer some of the mixture into a measuring cup with a spout or you could use a funnel to make filling each mold easier.